Has any of the UK owners had their recall letters yet? Was not aware there is a recall ?? Last edited by Botty; 01-25-2019 at 09:20 AM. Me neither - whats it for ? Am wondering if that affects all models? I am sure I read somewhere that the later models had different brake parts and I know the very new ones did because of the compulsory ABS? Will have to see but there is nothing yet on the recall site for mine. Well mine is an 18 model on a 67reg and mine has a recall on it! Apparently the piston gets corrosion build up and drags in the bore it nearly threw me off the bike it’s happened 5 times already and each time I have had to get a new calliper and disc! Yeah mines an 18 model. Might be the later ones they are recalling then because there is obviously a difference between the earlier ones and the later ones. 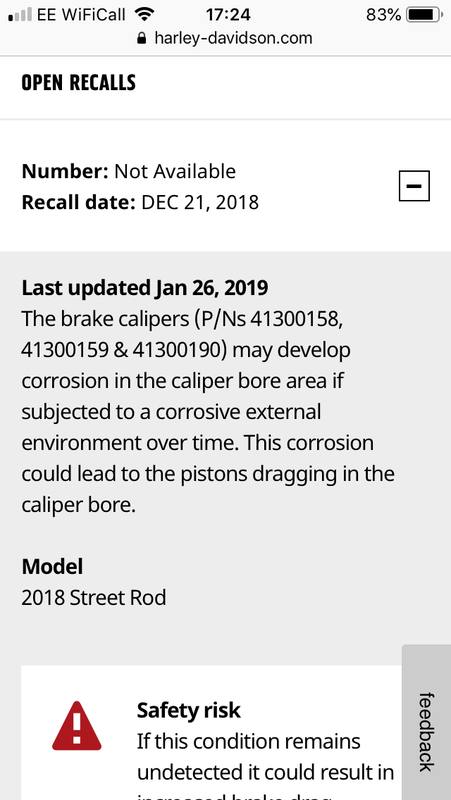 I see your attached thumbnail shows that this recall is for the Street Rod - I am wondering if the recall is only for that model then and not the basic Street? Nah mate apparently there is a one for the street 750 as well I had to put my VIN number in and it came back with that!! I had a 16 street 750 before my street rod and had the exact same problem with that bike front and rear brakes nearly threw me off the bike at 70mph not a good feeling I am at the point now thinking about trading in for something else I have had too many problems with this bike!